Wagering requirements are associated with bonuses. They are also known as play through requirements. Bonuses are offered by online casinos to ensure that the player wagers there. 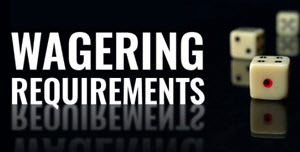 Wagering requirements are a means of implementing this objective. Players will be able to avail the benefit of the bonus, which is access to the winnings from wagering the bonus, only after the wagering requirements are met. Till then the winnings from the bonus are kept in the bonus account from which withdrawals are not allowed. Therefore in order to assess the suitability of the bonus players must also get acquainted with the wagering requirements. The wagering requirements will be found in the bonus terms and conditions. A link to these conditions is provided on the promotions page of the online casino web site. Many online casinos have different wagering requirements for the different bonuses on offer and hence the player should be careful. The wagering requirement spells out exactly how many times the bonus must be wagered before the player can request a withdrawal. For no deposit bonuses the wagering requirements are specified as X times the bonus. For deposit bonuses the wagering requirements can be specified as X times the deposit and the bonus or as Y times the bonus. If the second format is used then the wagering requirements are larger. When the player avails of a deposit bonus both the deposit and the bonus are credited to the player’s bonus account. Players can place wagers on online casino games from this account but cannot withdraw the funds or transfer these funds to their cash account. As the player wagers with these funds the casino software automatically keeps track of the amount wagered. Once the wagering requirements have been met the deposit and the permissible winnings are transferred to the player’s cash account. The bonus and the excess winnings are removed from the bonus account. Nowadays most online casinos follow an incremental wagering requirement system. Players do not have to complete the entire wagering requirements to get the due funds transferred to the cash account. If, for example, players complete 10% of the requirements then 10% of the due funds will be transferred. The first factors to look for are the wagering requirement itself and whether it covers only the bonus or both the bonus and the deposit. However, there is a lot of fine print to be gone through. Online casinos find that players from some countries are habitual bonus abusers and specify higher wagering requirements for players from those countries. This may be in a separate clause in the terms and conditions. Many online casinos specify the maximum limit for wagers placed during the wagering requirements. This is because they do not want players to complete the wagering requirements in a few wagers by betting large amounts. The most important factor is the games on which the wagering is permitted. Some online casinos allow wagering requirements to be met only on high house edge games like slots, keno and scratch cards. If players wager on casino games that are not allowed those wagers will not count. Other online casinos allow players to wager on almost the complete range of games but specify different contribution levels for each game. Slots usually contribute 100%, but other games may contribute 50% or 10%. If a player wagers on a 50% game then only half the wager will be counted for the wagering requirements. Suppose the wagering requirements are 20 times the bonus and the deposit and the player avails of a bonus of $100 on a deposit of $100. Also suppose that slots contribute 100% and roulette contributes 25%. Then the wagering requirements for only slots would be $4,000 and for only roulette would be $16,000.